The word "theology," roughly translated, means "words about God" but what if we thought of theology as words from God? What if, instead of thinking of theology as a way of talking about God, we saw it as a way of listening to God? God, who is greater than our language, speaks to us and we'd be wrong to assume his words to us are not at times larger than language as well. Theology, at its' core is not a timeless nailed-down description of God but an ever changing culturally appropriate way of thinking on God, a way which can and indeed must make its' way into every facet of life, including ethics. The voice of God speaks into every facet of life and does indeed prompt us toward mission and discipleship. So then, what's the difference? Perhaps listening to God and talking about God are closer in nature than you'd think. Rather than us sitting in a room and God in another as we do theology, God is sitting in the room with us. Rather than God sitting behind us, looking over our shoulder as we reflect, hoping that the light bulb comes on, and celebrating with us when it does, God is sitting across from us, in the ink of our pen, in the pixels on our computer, in the words on the page and He is speaking to us. He is speaking in utterances unattainable by human language, larger than words, and we are understanding it in our native tongue, hearing and grasping at the wind to match his language with ours. We hear, we understand, we are utterly speechless in our speech as we desperately struggle to repeat his words for the world. And the dim words we choose from our limited vocabulary to repeat these beautiful utterances are what we call theology. If we believed that this is how theology works, there would be no room for the arrogance so tragically common among those who call themselves theologians. Our hearts would be heavy with the task before us. Translating a foreign language we barely dare to understand would be our frightening vocation, rather than letting everyone else in on our great knowledge. Indeed, knowledge would have nothing to do with it, if by knowledge you mean something we've concluded from ruggedly individualistic objectivity. No, theology would be the outpouring of an experience much bigger than words, the experience of hearing God speak from the same mouth that spoke creation into being. As God speaks his words to us we can only struggle to repeat them min what sounds like a description but turns out t be everything else. We repeat the words spoken to us, words of calling, of prophesy, or revelation, or reconciliation, of Eucharist, and we repeat them in words which, no matter how poetically we try to repeat them, come out as only a squeak in comparison. We repeat God's words from God and they come out as words about God which prompt us toward hope-filled action and sacrificial love. I'm reminded of the Pentecost when the first Christians were filled with the Holy Spirit (Acts 2:1-13). The disciples of Jesus waited in the upper room, they didn't read a bunch of books, hold a forum on evangelism in a post-resurrection church, or anything most of us theological thinkers would like to do if we're trying to figure things out. 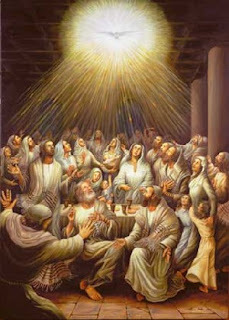 They waited and the Holy Spirit came upon them. They spoke with words unattainable by language but understandable. The people from all over the known world heard them speaking these utterances and understood it in their own tongue, in their own language. But could they repeat it? Were their words big enough to capture what had been said to them? Apparently they had some trouble with this part since Peter still had to preach a sermon. We, like crowds of nations searching for God, hear his voice, understating it in our own language, but struggle to find the words big enough to suit the story. And so we tell stories, we offer descriptions, we call out for repentance if only to glimpse again what we heard in our hearts. What happens too often is our words about God, which only ever were words from God, overshadow and drown out the voice we could not capture. We trade in God's words to us for our words about God as an easier substitute. We forget how to listen and so all we do is speak and if we speak of God without listening then we risk offering to the world a God not worth getting up for on a Sunday. We trade the word of God for words we can understand. What we must do is remember that the God we speak of is larger than our words, that his voice is larger than our words and that God is still speaking to us. Let theology be a way of listening. And those who have ears, let them hear and thereby speak in rigid understatement the words of truth so as to invite the world to listen again as in Eden.